Simon’s message grabbed me from the moment I watched his TED talk – and the book provides additional background. I’m not a reader of business books and this one kept me interested. Getting started with a new business/website/web presence can be daunting. Where do you begin? 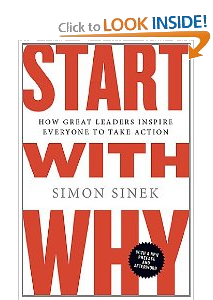 Simon Sinek, author of Start With Why, in the video below, shares compelling examples of the importance of knowing your “why”. What sets your business/organization apart from others like it? What role do you want your website/presence to fulfill, i.e. brochure, sell online, etc. ?